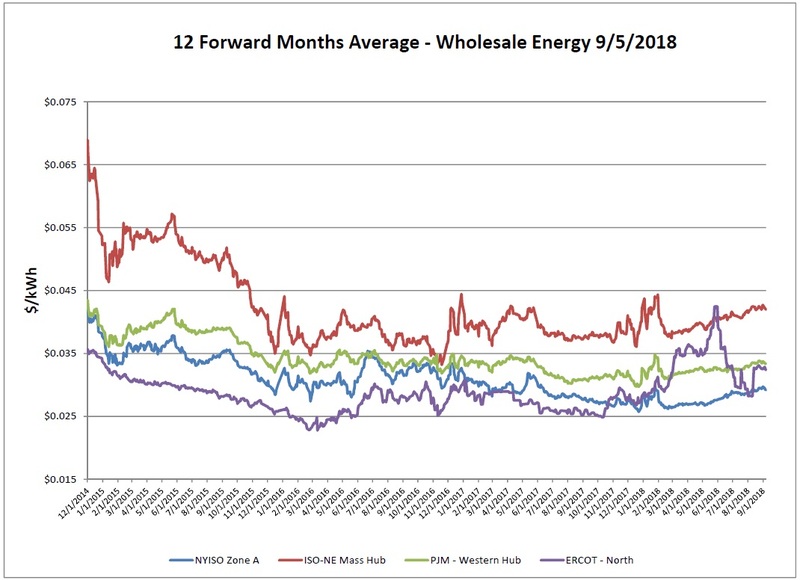 Although wholesale energy is up a bit week over week in NYISO, capacity is down, making all in price still very attractive. PJM is appearing to handle the summer loads very well with mostly stable prices. 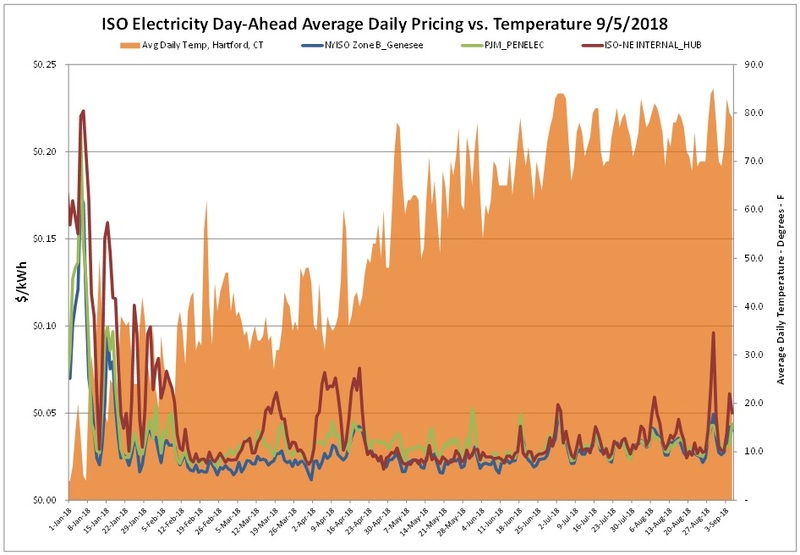 There has been very little volatility in this region given the very warm temperatures and they have been good at adapting to changes such as coal and nuclear plant closures. In recent weeks, ERCOT has begun to mirror PJM. Both markets prices are partially being set by high efficiency natural gas generation and being close to production regions. Keep in mind that the all-in price is a lot lower in ERCOT than in many of the other markets as they do not have capacity and other variables. Late July and early August are historically the hottest time of the year. This year, temperatures remained above average for an extended period of time, with heat remaining into September. Reports indicate this has been one of the most humid summers, and the 4th hottest summer on record. 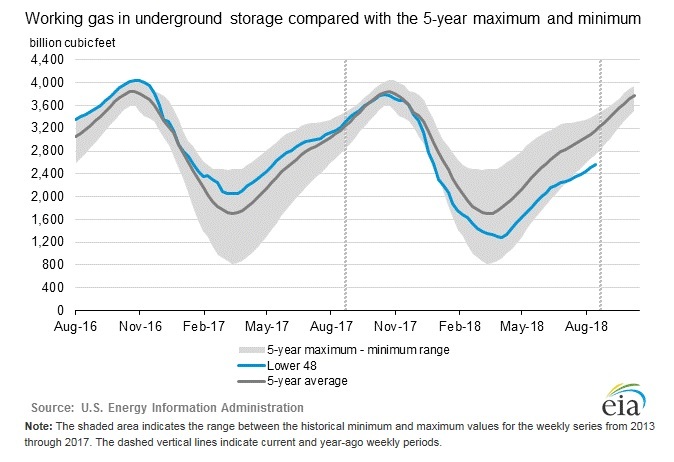 High loads and multiple occasions for the possibility to set (and reset) peak demand days have caused recent volatility. In Hartford, CT (the city we use as an average regional temperature basis) the August cooling degree days were 56% above the 5-year average, and 71% above last year. The gap between oil and natural gas widens as the price of oil continues an upward climb. Supply and demand factors we’ve discussed in the past in regards to the relationship between storage and price hasn’t been very dominate lately partially due to the high production levels. 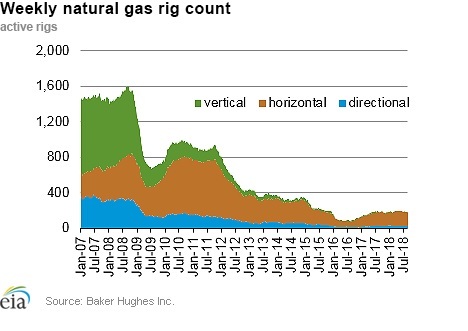 However, the potential for a bump up in the price of natural gas price is still very much alive. In combination with the record low storage levels, a destabilized market and potential for factors that could drive the market higher such as a cold winter could disrupt this. The NYMEX slide 4 cents on the 12-month strip and the Algonquin basis was also down 2 cents over the week. 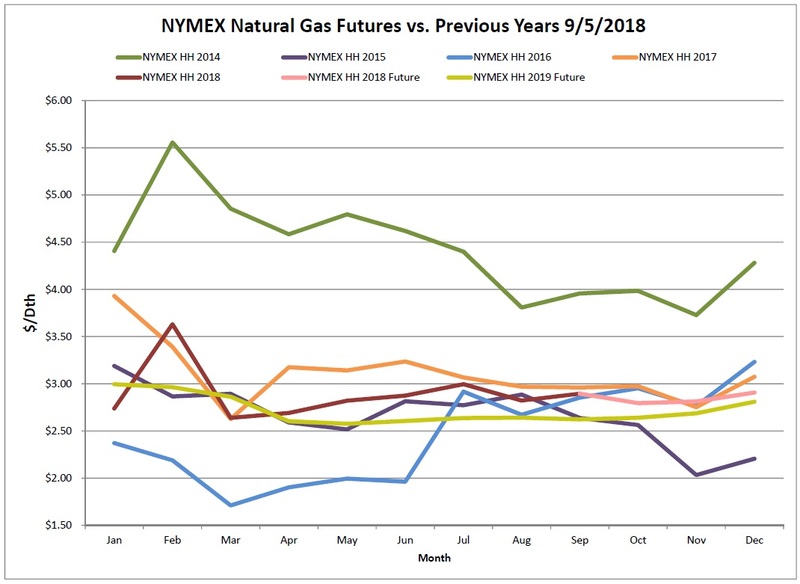 Compared to this time last year, the NYMEX is down but the basis is up considerably. The EIA reported a new increase of 63 Bcf from the previous week. As of Friday, August 31, 2018 working gas in storage was 2,568 Bcf. This injection was in line with last year’s 60 Bcf injection and the 5-year average of 65 Bcf. Surprisingly this was still a healthy injection report given the high loads during this period. The Baker Hughes exploration gas rig count increased 2 from the previous week for a total of 186 rigs. The report total is 1 rig more than were in operation last year when there were 187 rigs. 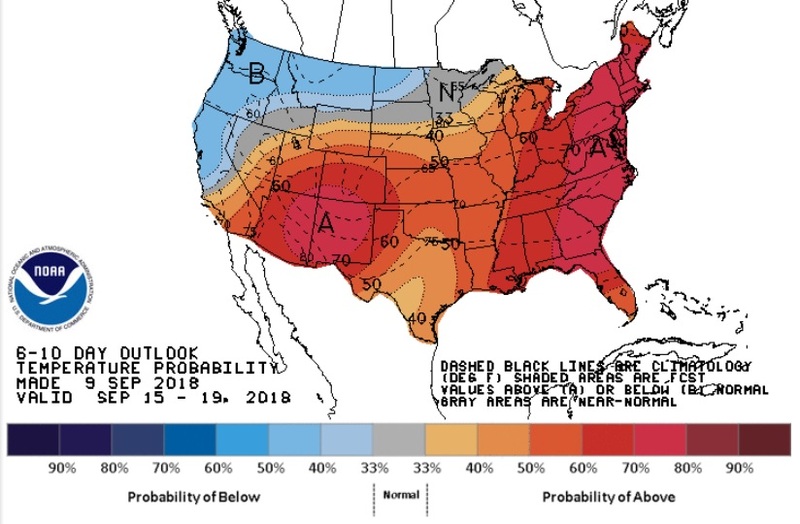 Weather forecasts continue to show above average temperatures through late September for most of the country.